I haven’t written a book review in a long time. For a while, I participated semi-regularly in From Left to Write, a virtual book club where we would read the same book and, instead of treading down that familiar path others take, we used the book as a jumping off point for a post. No rules–just what your heart insists must be shared. I loved this approach. It reminded me a little of some of the writing exercises used in my creative writing course in college. A great way to liberate myself when creativity slows to a molasses pace. And then, life got in the way. For the last month, my head has been filled with so many thoughts. So many things I wanted to say, but couldn’t find the right words, the right time, or the courage to share it all. No fewer than 4 times I attempted to sit down and type it all away, utilizing my usual method for working my way through difficult thoughts to find relief on the other side. But I couldn’t do it. When my head gets stuck, my other method of managing the situation is to get lost in books. Retreat. Research. Rescue. Release. 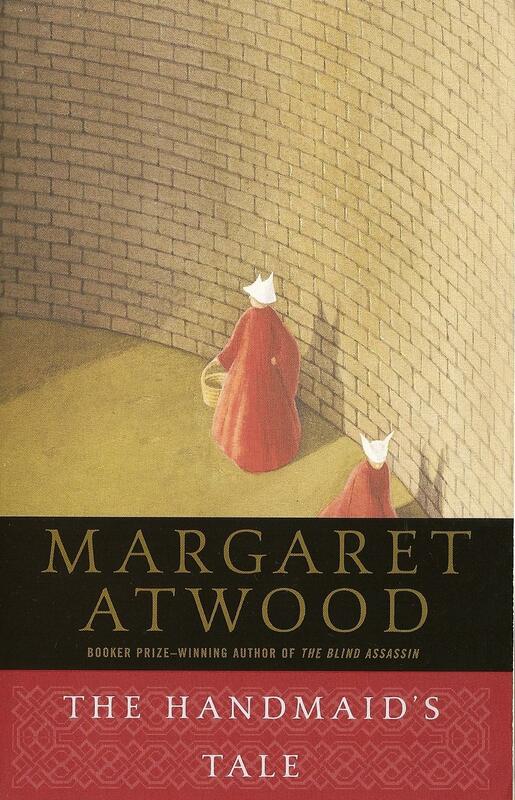 Many years ago, I picked up a copy of Margaret Atwood’s The Handmaid’s Tale. I don’t know why it called to me from that used book store’s shelves, but it followed me home that day…and sat on my own shelf for many years, passed by for newer novels and less weighty topics. Then, it started calling to me again…and I could resist no more. Hungrily, I devoured. Then I reached for my trusty pink highlighter, unable to resist the habit gained in the pursuit of a B.A. in English. So many words and phrases jumped off the page at me–so much to think upon a little longer and deeper. So much walking off those dusty yellow pages from 1985 that could have been written in 2016. This fictional work began to feel much more like a blueprint for what will happen. Suddenly, it wasn’t that far-fetched that women would be protected from themselves. That any method possible would be undertaken to keep them from making the men around them look stupid. That words would be reserved for men of means, and they would be rewarded for their placement in the upper echelon by being provided with a cook, house cleaner, AND handmaid for procreation purposes only, while the lesser men might not even be assigned a woman at all. That abortion doctors would be tried for crimes committed that weren’t crimes when they were committed, and the ultimate penalty would be paid: death. That their deaths would be used as an example for all that compliance is required. That zero tolerance would be given for those stuck in the system, while the men in power abused the system entirely. That human nature prevails, in the end. And after all I’ve seen and read over the last month, this, too, doesn’t seem all that far-fetched. In fact, it’s nearly inevitable. And the fact that I feel this way is damn frightening. I’m not handling things so well right now. Always. And those some are being revealed, now that the election is over and the positions of power are being chosen. LGBTQ. Anybody of color. Refugees. Women. Constitutional rights are being violated left and right, with a now very vocal white male privileged class grasping at straws to maintain some sense of power that they have long been losing–rightfully so!! !–and are lashing out at anyone who they see as a roadblock to making their lives great again. The thing is, nobody else’s lives were great in those times. Once you normalize insanity, it doesn’t take much to convince people that they’re better off. That it’s totally cool to assault others with different religious beliefs, treat women like chattel, deny science itself, destroy the world in the pursuit of financial gain. The last month has felt so unreal. A nightmare from which I cannot wake. A reality I never anticipated. A world I want not. And yet, here it is, all the same. I refuse to find security in these walls built from fear and hatred. I refuse to replace love with hate, empathy with suspicion, concern with disdain. There is no security here. And as much as that scares me, I won’t succumb. I will fight for human rights. I will fight for our future. I will not sit by quietly. I’ve never been all that political. I was unaffiliated from the day I registered to vote. I had placed my trust in the system, sure that, while I don’t always like the candidate or the party, they typically are not completely incompetent and the checks and balances will ensure hiccups are handled and that, for the most part, we’ll be okay. I no longer have this trust. And I can no longer bury my head in the sand. Because it’s all on the line now. We’re all responsible for ensuring we don’t fall back 60, 80, 100+ years with this administration. That our neighbors are truly safe. That our freedoms are secure. That we’re able to speak our minds, that the media accurately reports what’s going on, and that we are smart enough to discern the difference between truth and propaganda–reality and invention. The fight for rights has always been there, but I’ve been comfortable enough to not feel it before. I was lucky. Somehow, we the people have given the highest office in the nation to a racist, misogynist, immoral, xenophobic, under-educated con artist who is only interested in doing whatever he can to line his pockets and the pockets of his friends and family. The tarnish on his title-to-be is so thick that all confidence in the future is obscured completely. We cannot sit by idly and allow the seemingly-inevitable. We cannot feed hate. We cannot sell our children’s futures to make today a bit shinier. We cannot throw our neighbors under the bus to make ourselves feel “better than.” The only things we can be better than are ourselves yesterday. It’s not a contest. And we’re not in competition with each other. The only way out of this mess is with cooperation. That’s what will make our country great again. Beautifully said!!! It’s amazing how that a book written so long ago could be so on point for what’s going on now.